(BGF) – It has been over seven months since the collapse of the Rana Plaza building that killed over 1,100 people and critically injured many others. There hasn’t been much mainstream coverage on what is happening to the survivors of the collapse, however yesterday’s cover story on The New York Times explored just that, reporting on the lives of survivors many of whom are yet to receive adequate help and financial compensation. Over half a year later survivors continue to struggle to sustain their livelihoods as some cannot return to work due to their injuries and psychological trauma. In the wake of the collapse, they have been forced to adjust to lifelong disabilities, many of which are only partially mitigated by prosthetic limbs. Others, who were volunteers and firstresponders, are living with posttraumatic stress disorder (PTSD) caused by the horrific scenes they witnessed as they selflessly risked their lives to pull survivors from the rubble. Further exacerbating the difficulties of coping with lifelong disabilities and PTSD, many survivors and their families have little recourse to deal with the debilitating medical costs in the event’s aftermath. For many, work in the garment industry, including at Rana Plaza, was their primary means of providing for their families. Moreover, remuneration for injuries suffered and lives lost are inadequate, and the compensation that has been offered is delayed as the Bangladesh High Court decides on a suggested compensation package of around US$25,000. Though some companies, retailer associations, and NGOs have offered temporary relief, a longterm solution remains uncertain. Relatedly, the Times also draws attention to issues leading up to the factory collapse such as low wages, unsafe working conditions, and child labor which have yet to be resolved. It bears noting that many of these points align closely with the discussion facilitated by the Boston Global Forum during our November 18th Online Conference on improving minimal standards for worker safety and rights. For example, it was highlighted during our conference that many of the brands, now members of the Accord and the Alliance, only seek to prevent future tragedies like the Rana Plaza collapse. Meaning, they have not made any commitments to provide compensation to victims or their families. While it is important to prevent future tragedies, it is also of the utmost importance to ensure that the victims of the Rana Plaza collapse are not forgotten. 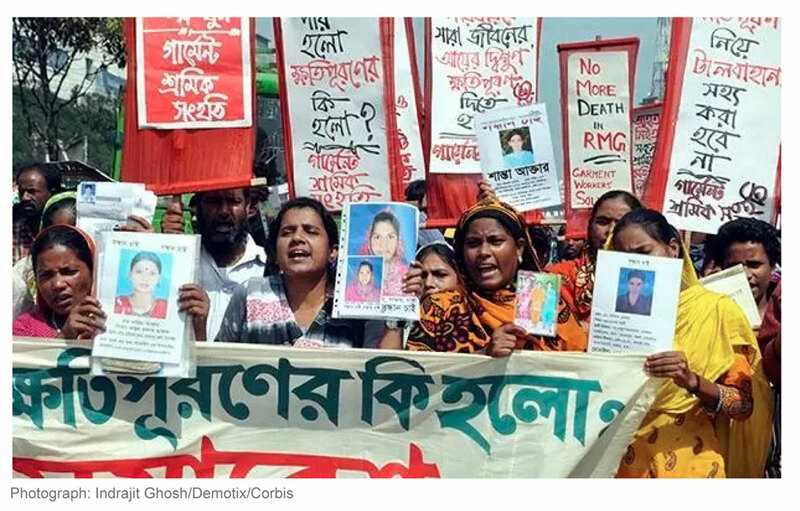 Furthermore, participants also noted that the lack of worker rights played a direct role in the tragedy at Rana Plaza as workers were forced to enter a building they knew was unsafe or risked losing their jobs. As such, it is important that we at the Forum monitor situations on the ground as we continue our efforts to work with policy makers and experts on issues of worker safety and rights. To address the issues that have come to light, we are developing proposed legislations to leverage The United States’ trade powers for international labor reform. Moreover, it is vital that we continue our efforts to utilize discussion with key stakeholders at all levels of government, civil society, the business community, and other interested parties to shed light on the issues affecting worker safety and rights globally. As The New York Times article illustrates, despite the recent efforts to prevent future tragedies, workers around the world are still vulnerable to low wages, unsafe conditions, and a lack of rights. Continued efforts to provide actionable solutions designed to enhance worker safety and rights and to shed light on the plight of workers globally are needed and the Boston Global Forum will continue to lead the way on these efforts.